2013 was an interesting year for Hip-Hop. Aside from it being the year of the mixtape, a number of major Hip-Hop singles came out this year, pleasing both older and younger generations of fans. This year, more than any other, we were able to witness an interesting juxtaposition of releases from Hip-Hop’s veteran and rookie classes. Industry heavy-hitters like Jay Z and Eminem shared rap’s social media frenzy with relatively fresh faces in the independent rap game like the Underachievers and Chance the Rapper. Meanwhile, Kendrick Lamar’s “Control” verse prompted a brief resurgence of battle rap in a modern age of radio-friendly rhymes, and old school resuscitators, Black Milk and Joey Bada$$ appeased purists with tracks hearkening back to Hip-Hop’s golden age. Quality, consistence, and sometimes, even controversy, characterized the year in music. 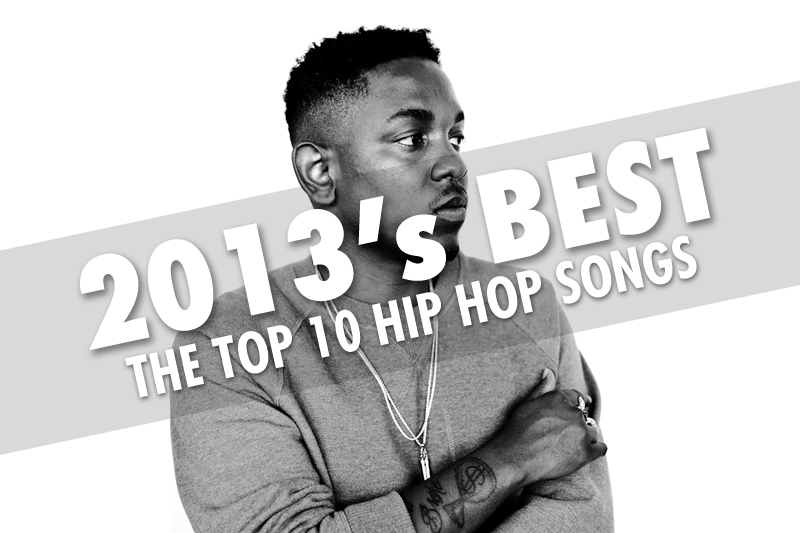 Hit the jump for my top 10 Hip-Hop tracks of 2013 (in no particular order). At just 20 years old, Chi-town’s Chancelor Bennett, otherwise known as Chance the Rapper, released one of the biggest mixtapes of the year in last May’s Acid Rap. Oscillating between pensive and tongue-in-cheek verses and ditching his trademark nasal cadence, Chance chooses the pensive approach on this track, meditating on adversity, violence, and past events that have haunted him. Equipped with a freestyle-ready beat from Don Cannon and Kanye West, G.O.O.D. music member, Pusha T, proved that even after a long sabbatical from making music, he could still hit us with the same raw rhyme scheme that propelled him to fame with Clipse. Can you feel the buzz? The hype behind the second upcoming collaboration between MED & Blu has been intensified with this Madlib-produced single. Black Milk is known for reinventing his sound every so often. This cut off of No Poison No Paradise is the most recent example of this. With its soulful, gospel-inspired sampling, this somber street narrative is a testament to Black Milk’s continuous progress and evolution as a lyricist and solo artist. I’ll be honest. Ye’s latest release did not impress me, but with its minimalist backdrop, heavy soul-sampling, and trademark ‘Ye-isms, “Bound 2” is clearly a throwback to the Kanye of College Dropout. Forget the music video for now, though. I mentioned earlier that 2013 was the year of the mixtape, and Brooklyn’s The Underachievers nailed it last February with their debut mixtape, Indigoism. This Souls of Mischief-inspired cut is a good example of the duo’s slick wordplay and ear for quality production. It’s no wonder they got the attention of Brainfeeder bossman, Flying Lotus. With a sinister, minimalist backdrop sampling “Intro” off of Disc Two on Wu-Tang Forever, De La Soul takes us back to 1997 for a few minutes, while summoning the spirit of the Wu, and the brooding, spaced-out production style of the RZA. After a long hiatus (9 years, to be exact), De La Soul demonstrates that the classics are still forces to be reckoned with in the new generation of Hip-Hop artists. For a track that didn’t make the final draft of Hall of Fame, Big Sean’s “Control” caused quite the media storm. Clocking in at almost eight minutes, the song itself, and the guest cameos, are at most, average. However, when discussing Hip-Hop in 2013, the mere impact of Kendrick’s now infamous verse is worth noting. He delivers with tenacity, and whether or not you believe he’s the current king of rap, one thing is for sure: battle rap’s mainstream resurgence was real in 2013. Along with The Underachievers, the beginning of the year marked another solid mixtape release from Joey Bada$$. This debut single, produced by DJ Premier, is a nod to a more classic era. Hip-Hop may be far from entering another golden age, but it’s moving in the right direction. With its soft guitar loops, laid back hook, and vintage Common flow, “Quicksand” is one of the strongest posthumous J Dilla releases to date. The Yancey Boys collective (Illa J and Frank Nitt) did excellent work on their latest Delicious Vinyl release, Sunset Blvd, and I can only expect more insta-classic goodness from the crew in 2014.